One person was killed and another injured when a Smart Car and a truck collided at Biscayne Boulevard and Northeast 15th Street. The accident took place at 5 a.m. on Wednesday. According to Miami Police, the Smart Car, which was rented from Car 2 Go, caused the accident by running a red light and t-boning the Chevy Silverado truck. 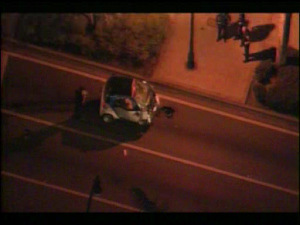 According to CBS Miami, the driver of the Smart Car was rushed to the hospital and is in critical condition. The driver of the truck was treated at Jackson Memorial Hospital and was released. He suffered a spinal injury and a concussion. The Smart Car passenger died on the scene. According to police, alcohol may have been involved in the accident. The intersection was closed for several hours for investigation. According to a Car 2 Go spokesperson, the Smart Car features a GPS device that reveals where the vehicle was before the accident. Vehicular accidents are tragic, especially if death or injury is a result. On top of hospital fees, victims may miss time at work, and in serious cases, injuries can prevent a person from being as productive as he or she was before the accident. After a consistently successful track record that includes jury trials and settlements, Wolfson Law has earned a reputation as Miami’s top personal injury and accident firm. Visit the website, WolfsonLawFirm.com, to view a case history overview. With good representation, you can substantially speed up the trial process and possibly avoid a trial altogether. An experienced injury attorney can also maximize the amount of damages collected. For more information, give us a call at 305-285-1115. One of our attorneys will give you a free case evaluation. For more information about our practice, visit WolfsonLawfirm.com.